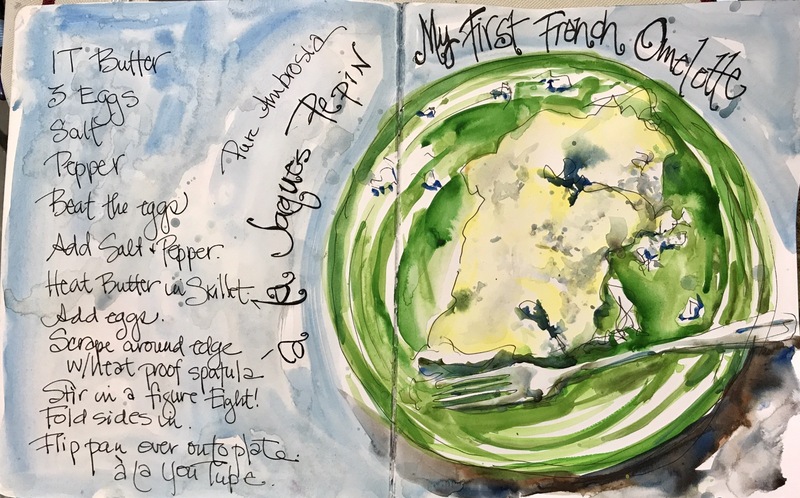 Ever since I read Julia Childs Mastering the Art of French Cooking as a child I have been in love with the notion of all things French and especially the quintessiantal French food – the omelette. 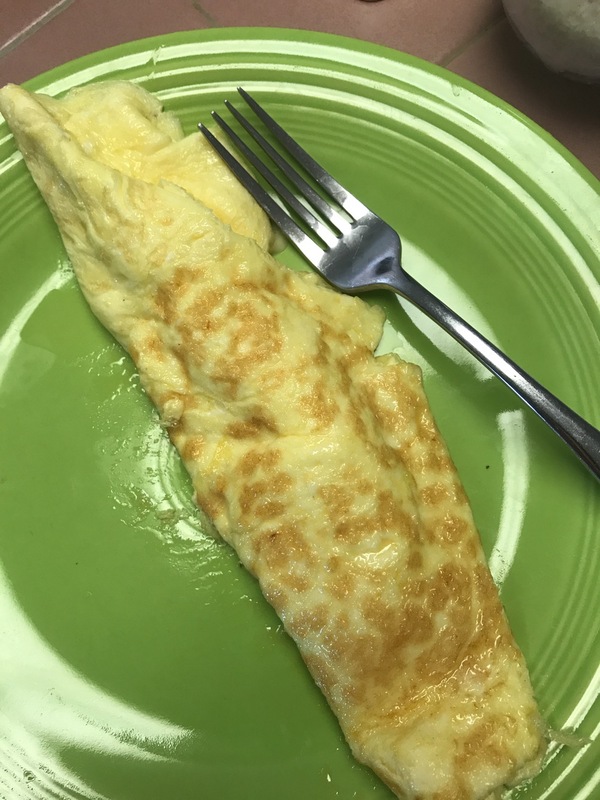 But I never could figure out how they made that neat rolled omelette. Watching Jacques Pepins American Master show on PBS I thought YOUTUBE!! Sure enough. There he was teaching how to cook an omelette. Omelette Number 1 of course I had to draw it to commemorate the occasion. 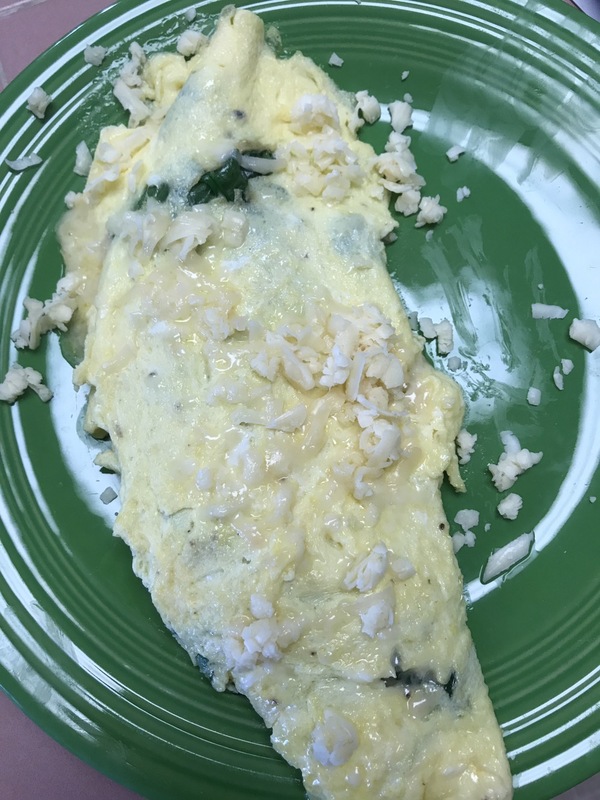 First mistake I had been making was not using the right pan so I got it a big 10-12″ round edged skillet that was coated w the green coating that releases easily. And I hadn’t been using the spatula to scrape around the edges as I cooked. Who knew? And I stuffed mine. Trying to eat those greens and I had to have some Cheddar cheese. The most delicious thing I have ever eaten. I swear. Not so pretty but amazing. Prettier shape but too brown. Anyway colors used to paint it. Cad yellow light, cerulean, yellow ochre, green apatite and sap green for the plate, Ultramarine Blue and burnt umber for the shadow. TIP: Splattered with palette mess left from painting. Has to be really soupy to splatter. Use more water than you think. And I just use a large paint brush in this case my 10 Da Vinci. I also painted this with the same paint brush.